Amazon Echo Review – Hey Alexa! How does it feel to get a new assistant that does everything you say without questioning you? Amazon has made life so much easier by giving us another Echo. Amazon Echo is the new command prompt for every kind of life like domestic, office, school, hostel and others. This time round, there is “Alexa” from amazon, the new intelligent assistant. It takes very few minutes to be acquainted with “Alexa”. “Alexa” is not human but a smart Echo Bluetooth speaker. It is voice controlled and has a Siri like assistant that goes into a tube. This tube with the Siri like assistant answers any question asked once connected to the Wi-Fi. Echo allows you to listen to talks and tunes from TuneIN, iHeartRadio and Amazon prime. When you beam it over Bluetooth, then you get all your preferred music collections from Pandora and other places. Amazon does not have its own voice assistants as the best known, like Siri, Cortana and Google now are only limited to Microsoft platforms, Apple and Google devices. Echo is the first major step Amazon has up with towards joining the world of mobile assistants. It is however not mobile as it stays in a fixed spot inside the house, a student’s desk, office desk or anywhere else you prefer. We wrote about Amazon Echo and its features earlier, do check it before you read this article. 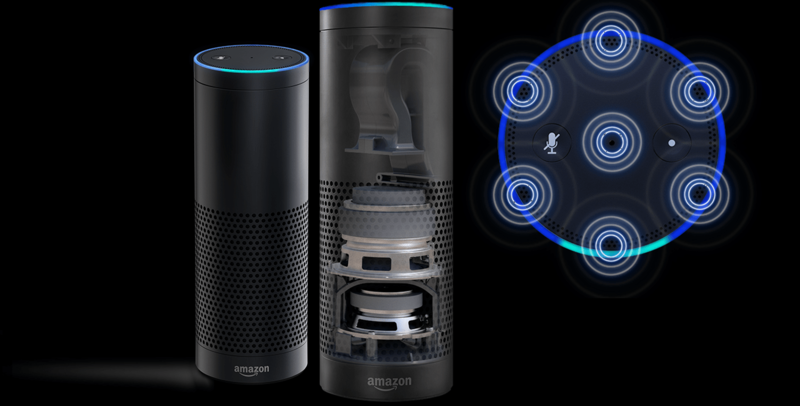 Echo works by listening to all the commands you ask it but this only happens after linking together all the homes powered systems. These are systems like the heating system, lighting, cooling, and entertainment. They will however need controlling in one way or the other. What you need to use Echo ? A visitor in your home or if you are a student and have one in your room at the hostels, would miss out on what amazon is if they did not already know. The tube is very subtle and looks like a painted fancy wine or whisky bottle. The bottom is canvas, which has holes that let out the sound from the speaker find its way out from the enclosure. The top of the tube has lights that form a beautiful ring. These lights indicate everything going on. On activation of the speaker, the rings flash white, blue, and gives a red glow all around after muting. Echo works by yelling commands at it. However, if you are not the yelling kind, there is a mic-enabled remote very similar to the voice remote on Amazon’s Fire TV. It has few but available physical controls. Press an action button at the top when changing the Echo to a different or new place. If you want to cut the sound, there is a mute button to use. For turning the volume up or down, twist an almost invisible ring on the half-inch top of the tube. Echo has no outboard battery so only works when plugged into a power outlet. Download the companion app on your device or your desktop. The app guides you through a three-minute procedure on how to set up and connect to Wi-Fi. After that, the Echo takes all the commands after saying the activation word, which is “Alexa”. When it comes to finding basic information, “Alexa” does everything and if by chance “Alexa” does not have an answer to a query, it will not give up but perform a Bing search and display the results in the app instead of reading it aloud to you. Echo has very other amazing attributes and if you are questioning yourself on whether you should buy it, the answer is definitely yes. It sells for only $100 at Amazon.com and it is a fun gadget to have. A gadget that speaks back to you and answers all your questions is simply amazing. If you writing up any tech content for a website, make “Alexa” your new essayshark and ask all the questions you want. Amazon Echo makes life a lot more easier.